Finding studs in a new house to decorate your walls with family pictures or mount your television can be tricky. 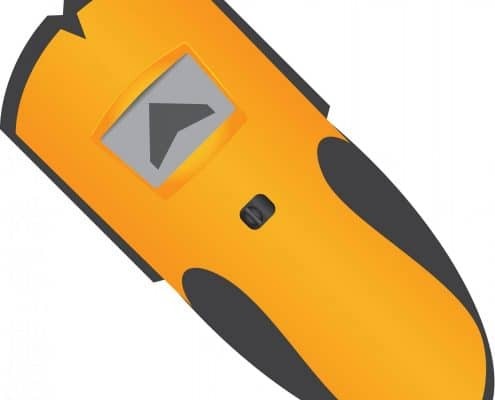 Of course, if you have a stud finder laying around in your tool bag, the job might be a bit easier. However, most stud finders, especially the cheap ones, can be inconsistent and unreliable. Stud finders usually range from $5 to $300 and most people, unless you do regular construction work, don’t have one on hand and ready for use. Especially after moving when everything is packed up and unorganized. So, what are some ways to find studs in a wall right after you move? There are simple techniques you can try to get your pictures hung up in no time. If you have no knowledge of how walls are built and have no idea where to begin to look for studs, there are a few things you can learn that will help you get started. Every house might be built a little bit differently, but most of them have certain things in common. Builders began constructing the typical stick framed homes with 2×4 or 2×6 studs after 1920. Understanding the basic construction of walls comes in handy before you start your search for studs. Studs are spaced 16″ to 24” from the middle of one stud to the next. However, 16” the most common dimension. Studs will reside on either side of doors and windows. The spacing for these studs could be different because they position them on floor plans instead of the traditional 16” spacing. 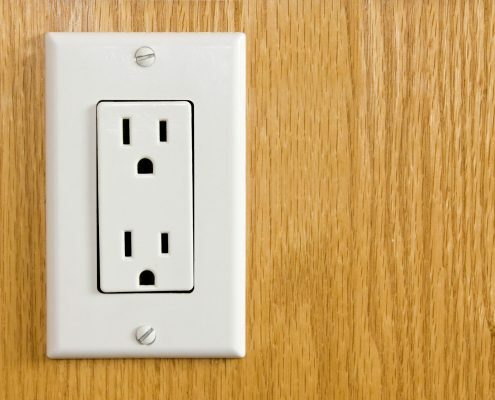 Another way to figure out where to start looking for studs is to find where your electrical boxes are, such as switches and outlets. They will usually be attached to one side of a stud. The actual dimensions of a 2×4 are not always the same. The measurements could be smaller, depending on what year the house assembled. For example, if the house built between 1900 and 1950, 2×4’s that were rough cut was most likely used and measured 2” by 4”. If they built your home between 1950 to 1965, it probably has 2×4’s that measure 1-⅝”-3-⅝”. Homes built after 1965 have 2×4’s that are 1-½” to 3-½” in dimension. The actual measurements of the lumber used in your home matters if you measure from one stud to the other. Looking at the trim of your home will also tell you where the studs are. Crown molding, shoe molding, and baseboards usually nail to studs. However, it won’t be noticeable where they are connected because the holes and dimples from the nails are usually caulked and painted over. If you find where it’s nailed, try measuring in 16” increments. You can usually tell if you have found a stud by knocking gently on the wall. The sound of a spot with a stud versus one without will have more of a thud noise than a hollow one. If measuring by 16” doesn’t work, try 24” or every two feet. Using the switches or outlets in your walls is another way to find studs in your walls if you luck out with your search using the trim work. Most switches and outlets are attached to one side of a stud. You can usually determine their location by tapping the wall where the electrical box is connected. Once you’ve figured that out, measure about ¾” away from the switch or outlet and start your search for a stud closest to where you want to hang your picture. Since studs are usually 16” in measurement from the center of one to the other, you can also start your search from the corner of the room. Using the knock test, you can determine where the studs are on the spacing of 16” or 24”. However, since most rooms depend on measurements divisible by four, you might come across a stud that is closer or farther than 16″ or 24”. Using a magnet is an easy way to locate the studs in your new home if you have one handy. If not, it doesn’t cost very much to purchase one for the job. Once you have your magnet, all you have to do is slide it along the wall until you feel it stick. What it’s attracted to is the head of the nails in the stud that was used to build the house. Keeping a magnet around for future use might be a good idea to help you hang pictures another time. 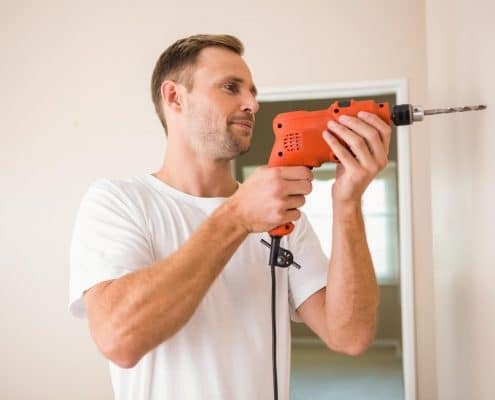 If you choose to use a stud finder to locate the studs in your wall, they all usually operate the same. Place the stud finder on the wall and turn it on. They typically turn on by the buttons on the side of the device. Slide it horizontally on the wall until the lights indicate that it’s found a stud. Mark the location with a pencil. Use this as a starting point to locate the other studs in the room. 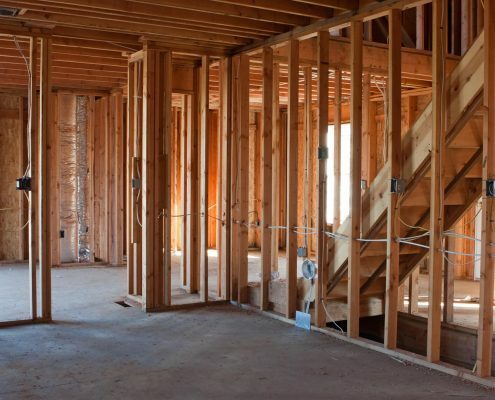 If you had your house built instead of buying it, take photos of each room before drywall is put up to help you get an idea of where the studs are in your home. This trick is also helpful if you ever decide to build on to your house. This way may not be the best way because it puts excessive holes in your walls. Find the spot you want to hang your picture. Try tapping on the wall first to locate the stud. Once you think you have found a stud, drill a hole in the wall to see if it comes into contact with a stud. If it does, you know where to hang your picture. If not you can try again in another spot until you find the stud in the area desired. Hopefully, you can now find studs in your home by using the tips suggested. You can have all your pictures hung in no time. Don’t forget that we love helping our heroes and their families in any way possible. Head on over to our local deals page to get some great discounts.